Types of chocolate producers: Home-made, Premium and Industrial. Homemade chocolate producers operate a single or very few stores in a city, and make their chocolate offerings by hand using smaller equipment, usually at or very close to the store. Such outlets are among the most exciting places to visit. You are likely to meet the chocolatier here, who might recommend what you should be treating yourself to! 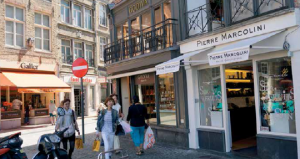 Premium chocolate producers operate their own chain of retail stores across Belgium and produce their chocolates with a combination of handmade and mechanical processes at their processing units, focusing highly on innovation. Industrial producers operate factories to produce large quantities of chocolates, mainly bars and tablets, using advanced and automated processes, and sell their products from supermarkets. Belgian chocolates are available in various sizes and shapes—bars and tablets, pralines, ganache, truffles, Napolitains, caraques, mendiants, dragées, orangettes, powders and spreads. Homemade pralines have the biggest advantage, as they are able to reach the retail shelf within a few hours of being manufactured and one can literally taste the freshness, while Premium pralines are usually replenished once every week, and both have a shelf life of 4–6 weeks. Industrial chocolates have a shelf life of up to 12 months. Premium chocolatiers consider using vegetable fat against their beliefs and traditions, and stick to using only pure cocoa butter. This ensures that the intensity of the cocoa flavour is retained and bought to the palate. The experience is thus smooth, silky and memorable. With supermarket chocolates, on the other hand, one can compromise and add some vegetable fat in order to lower costs. The other significant differences are the low quality of the bean used in supermarket chocolates and the highly mechanised processes used to produce thousands of bars a day, compared to a few hundred handmade chocolates! The low-quality bean really does not play any role in flavour enhancement in Industrial chocolates and is overshadowed by the other ingredients used to add flavour. A visit to a chocolate factory can change your perspective about why chocolatiers deserve the credit and premium they demand! It can leave you overwhelmed seeing the number of chocolates being processed. The aroma of the beans being roasted makes you want to freeze that moment in time. The paste created when cocoa beans are pressed can tempt you to bottle it and take it home. During conching, the cocoa and sugar particles are ground into particle sizes that are smaller than what the tongue can detect. At this stage, you will barely be able to stop yourself from dipping your fingers into the smooth chocolate mixture and licking them.